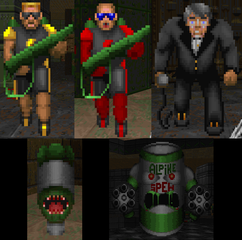 Many Doomers are familiar with Chex Quest. But are you familiar with id's flirtation with Kick? Kick Attack! 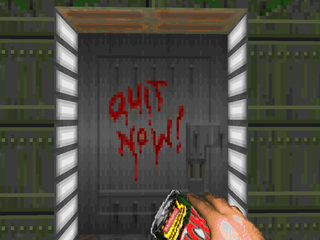 is an interesting footnote in Doom's history. It seems the folks at the Royal Crown Company were looking for a way to market their new citrus softdrink (a la Mountain Dew and Sprite) digitally and the person they hired had the brains to suggest a partial conversion for id's Doom to sell along with the soft drinks (but available on its own at the marketing website). A meeting happened, id gave them their blessing (in exchange for a lot of Kick), and suggested that the company have Tim Willits make the map. Throw in a bunch of goofy graphics later, and you have Kick Attack! for Doom and Doom II. As for the plot... You're the quality control manager at a Kick bottling plant. A sampling of the most recent batch proved to be less than thrilling. It lacked Kick, so to speak. After a careful investigation you find out that some unruly insurgents are pumping “Alpine Spew” into your brew, and they've taken over during your examination. You grab the pistol from your desk, a can of kick, and prepare to do battle with these dregs of the bottling world. 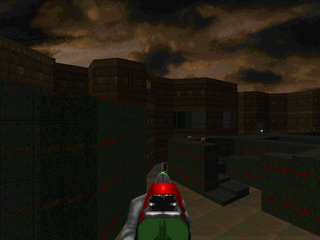 Gameplay between both versions is identical. 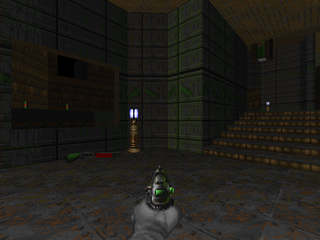 The main differences are Doom vs. Doom II textures, which is understandable, as well as the opening screen. 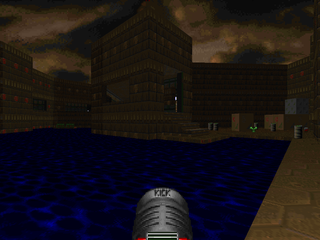 The map is a standard Doom techbase filled with a number of monster replacements. There are a few sprite conversions that take the place of the sergeant, imp and demon, as well as all new graphics for lost souls and the Spiderdemon, the end of level boss. An edited zombieman becomes the shotgunner while the sergeant becomes the imp. The demon replacement is none other than lounge singer Mel Torme, whispering "C'mere baby", while the lost soul appears to be a nightmarish liter bottle with pointy teeth, and the Spiderdemon is one giant can of Alpine Spew. As mentioned, it's a pleasant but unimpressive techbase. 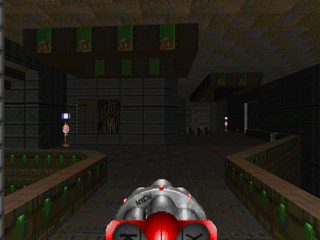 Texturing and detailing are nice, though I feel that it looks a lot better in Doom II (the Doom textures are much more obnoxious). Fight monsters, grab the key, access the next area, repeat until you flip the final switch. Some moments worth mentioning – the raised walkway with rails segment around the middle of the map looks pretty sharp, though I was expecting a neat ambush around the yellow key. Also a three-way switch near the end, one of which is a trap. There aren't a whole lot of foils, which makes the map fairly easy, especially since the only weapon not represented is the BFG. I will say that the boss arena looks quite snappy with its beveled columns and gives you plenty of cover to be overconfident with. It's interesting to see the commercialization of Doom from a different angle, doubly so given that it's basically a forgotten Tim Willits original. While not challenging by any means, it's a fun romp, one worth a playthrough, especially if you're looking for a map showcasing monsters from the original Doom's roster. In my opinion, Digital Cafe put together a better project, but I appreciate this sidenote from Doom's history, and recommend it to the similarly inquisitive. Been looking for this for over a decade, I used to have it and this whole time I thought it was Surge soda and not kick lol no wonder I couldnt find it, never got the chance to play it either because when I had it I had no computer and the computers at school didnt have the min requirements! Oh the good old days!